By Joyce McPherson (GreenLeaf Press, 1995), pb., 124 pp. Blaise Pascal is another key figure in history that we would all want to introduce to our children. He was one of the most important scientists and mathematicians of the 17th century and after his conversion became ardent proponent of the faith. The author of this book has also written a biography of Calvin which has been reviewed previously. As important as Pascal is, this book was not very compelling to my boys- ages 10, 8, and 6. Mrs. McPherson begins with his childhood and seeks to describe his youth as well as adulthood. The inclusion of children often helps with making a book interesting, but this one never really grabbed them. Describing for a young audience Pascal’s work with math and science is no doubt difficult. My boys would much rather hear about a battle or mystery. Some of the science work could, it seems, have been described in a way that would be more accessible to children though. Concepts- theological as well as scientific- were introduced with little explanation or clarification. For example Pascal’s involvement with the Jansenists figures significantly in the latter part of the book, but there is little explanation of what this movement was about. 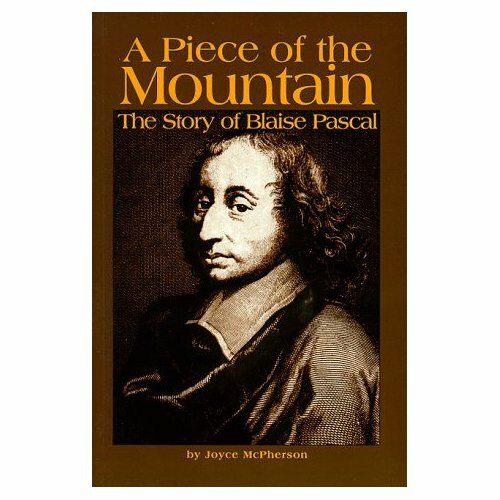 Pascal is an important enough figure that the book is worth reading if you can help your children to stick with it. Pascal provides a good example of one who worked hard at his school work for example. This application is not made in the book, but you can make it. Also, the end of the book is the best part. After doing secret writing on behalf of the Jansenists (some intrigue which peaked interest), Pascal and his friends must face the wrath of Rome. Pascal’s stand is worthwhile reading for one’s children. Still, your children may pick up (as at least one of mine did) that Pascal is still with Rome even after the Reformers have broken away. Children need explanation as to why one we are reading of as a hero continues with the group who so persecuted others we have held up as right. The book offers no such explanation.